Outdoor Solar Decorative Lights - Too Cute! Just $10.79 with Coupon Code! Outdoor Solar Decorative Lights – Too Cute! Just $10.79 with Coupon Code! 2018 UPGRADED VERSION & Eco-Friendly - The petals are beautifully designed to mimic real lily, and the material of the flower is fabric. If you want to make your garden colorful, these unique solar lights will bring you solar garden light decoration solutions, and they will add more fun to your family and friends. Durable & High Quality - This solar outdoor flower light is designed with heat and water resistance IP65 and it survives hot, rain, cold and frost. Flowers and stems are made of high-quality materials and have been proven to be used in inclement weather. This solar stake lights can work about 6-8 hours at night if fully charged during the day. It has a lifespan of 3,000 hours, far exceeding any outdoor solar LED lights. Tool-free Installation & Maintenance Free - The beautifully designed outdoor solar lights do not require wires and external power, and the garden lights will automatically illuminate in the dark to illuminate your backyard and passage. Perfect for path lights and underground lights, suitable for planting near trees, flower beds, fences, and walkways. Upgraded Solar Panel & Smart Light Sensor - Full range adjustable light angle to illuminate perfect spot and adjustable solar panel angel for optimum sun exposure. We also upgraded the wider solar panel to convert sunlight into electricity faster and more efficiently in cloudy weather. The smart light sensor will automatically light up and change the color per night. 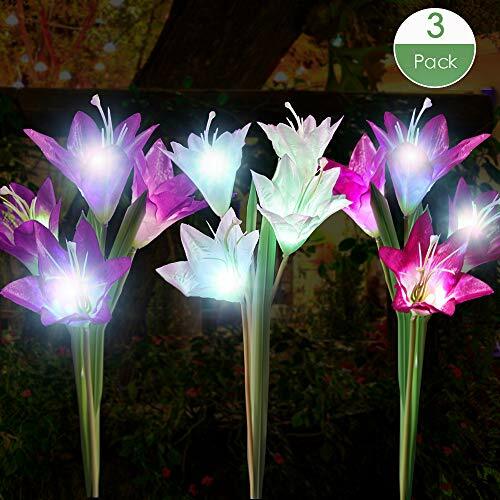 Ideal Gardening Gifts & Decoration - This solar flower lights outdoor include 2 packs of Flower lights. Each package changes 7 different colors to promote the desire atmosphere for any occasion, whether for backyard activities or for the finishing touches of outdoor masterpieces. This is also the perfect gift for friends and family. Choose YiFi-Tek Solar Lily Light, which gives you a higher brightness and more colorful atmosphere, allowing you to enjoy more colorful ambient lighting in the garden.